Well, the Oscars weren’t much to waste 3 hours on, but I did it anyway. Sigh. Billy Crystal wasn’t all that funny; I found some of the comments he made kind of rude, actually. The gowns most of the women wore were gorgeous, but what was that thing with Angelina Jolie and her skinny leg? Bizarre. Unfortunately, the only movies I saw out of this year’s crop were The Help and Hugo. Hugo was terrible; The Help fantastic. I was pulling for The Help to win, but The Artist looks like a fabulous film, so I’m going to have to reserve my opinion until I see it. I was happy for Meryl Streep (isn’t she absolutely gorgeous?) and thrilled for Christopher Plummer — the way he bounded up those stairs you wouldn’t think for a moment that he’s 82. But, it’s all behind us for another year. Just one question though, why was there only two songs nominated? Does no one care about the music that accompanies movies anymore? We had our blizzard. Our burrowed into the house with my books and waited it out. It was lovely. Tim was away and I had the house entirely to myself. Quiet. Long stretches of it. Bliss. And then, I had to face the hip-deep drifts of snow that had blown into my driveway. My doorway and steps and walkway were obliterated by snow. I headed outside around 11:30 yesterday anticipating a couple of hours of back-breaking lifting and heaving. I got the steps, landing and walk done, and then the driveway around my car. As I was getting ready to tackle the deepest stuff, though, my neighbour from across the way came over with his snowblower and did it for me! I can’t tell you how grateful, how relieved I was that he did that for me. I finished up in just over an hour. So very, very grateful. Now, we’ve got just over a month to go before Spring is here once again. I love that the mornings are getting lighter and lighter each day. I can feel myself waking up again. The world is a wonderful place. When Heather and I started out on our walk this morning we were joking about how the weather is never what it’s forecast to be. But it was very mild — 0 degrees — with barely any wind and just a few snowflakes drifting down around us. As we got further into our walk, though, the snow began to get heavier. Soon, it was that beautiful snow, the kind we remember from our childhood. 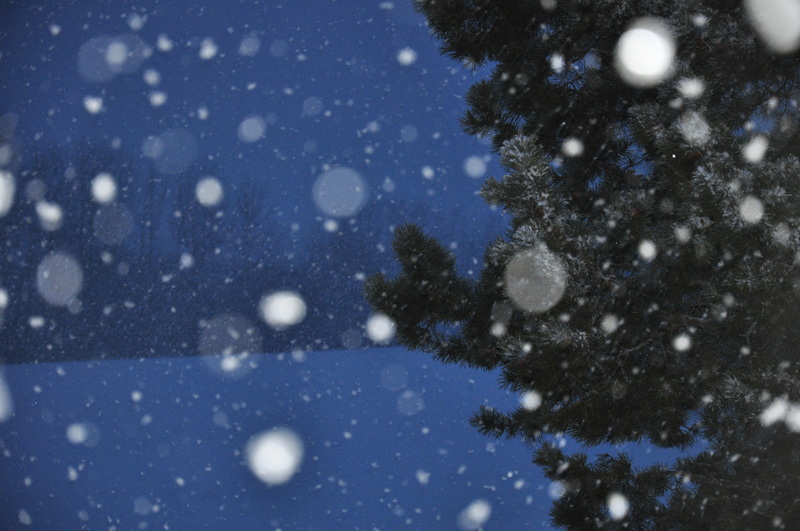 Big, soft, white, fluffy flakes that tickle your face as they land. They stuck to my glasses and drifted into my mouth while I talked, making me choke a little. But, it was nice. We laughed and enjoyed watching the snow plummet down to the ground where it swirled and danced around our steps. This is the kind of winter I like! If it could always be this beautiful and heart-lifting I’d never complain. Yes, there will be shoveling to do later, but it will be fun –like shoveling feathers. My picture is a poor one, shot from my balcony door — all I had time for in the rush to get this done and then get ready for work. Hope it conveys some of the beauty I enjoyed this morning. Well, it is a gorgeous sunny afternoon here in Bon Accord. A bit on the cold side, but, really, for February, not so bad. I had a very nice visit with my sister Jennifer and her family this weekend. Tried to work my son and his family into the mix, but, alas, it was not possible. They are a very busy bunch! As it is right now, I am enjoying the afternoon to myself. Jenn, Dave and the kids went home this morning, and Tim went out for a ride with his friend Dave. I finally finished Black House. What an abysmal disappointment! The Talisman was such a fantastic book, but this sequel was nothing but a sad mish-mash of nothing. It took forever to get to the actual story, and then it was treated so tritely it was almost an insult. Characters were never fully developed, and those I thought crucial to the story were just dropped off the edge of the story as if in to an abyss. I have never felt so cheated as I have by this book and these two authors, who I count as favorites. Surely, they didn’t write this book only for the money? Neither of them needs it, so I can’t imagine why they bothered to waste their time and the reader’s. As soon as I kicked Black House to the curb, I picked up The Hunger Games. I have heard much about this book, and now the movie is coming out shortly. Therefore, I must read it. And so far, I’ve read four chapters. It’s a quick read, well-written and engaging. It’s a familiar theme found in many futuristic stories, but there is an interesting little twist to it. I have all three books in the series and think I should be able to get through them all in the next month. I had set a goal of reading a book a month at the beginning of 2012. It’s taken a month and half to get through Black House. If I can read all three of The Hunger Games books, I’ll be ahead of the game! Something to complain about: Bruce Springsteen has not released any Canadian dates for his new WORLD tour. What’s with that. Are we not part of the world? I really want to see him in concert again before he decides to retire. And, as he is 62 years old, I can’t imagine that retirement is too far off. I just bought two new Bruce albums (new to me) The Seeger Sessions (absolutely amazing — what I wouldn’t have given to see him perform the concert version of that album in Ireland!) and Lucky Town. Lucky Town is an album of works from earlier in his career (a little before the mid-point, I’d say) and has some wonderful, haunting tunes on it. If you’re a Bruce fan, I recommend checking out both of these albums. The Seeger Sessions, though, is my immediate favorite — Old Dan Tucker gets me in a great mood on the ride to work these days. I hope everyone had a terrific Family Day (those of us lucky enough to enjoy such a holiday) — and if you weren’t, well I hope you have a fantastic and stress-free week ahead. Just something to celebrate the past week, and well, because it’s Friday. I’d bake you a cake. To infuse it with joy. My Valentine’s cake, with wine of course! Oh, it was ooey and gooey! It’s Stupid-bowl Sunday, oops, I mean Super-bowl Sunday. Tim’s all geared up with beer and chips. He’s a happy little fella. Me? I’m going to bake. Granola bars and bread. Get some stuff done for work tomorrow. Kick back, relax, read some more of Black House (which is a MAJOR disappointment, I must say), maybe contemplate beginning a crochet project. We’ll see. Spent the weekend at a CUPE bargaining conference. The best I’ve ever attended. KUDOs to our new AB Div President and the team she assembled to make this weekend such a success. I’m not a political animal or much of a networker (probably why I’m not very successful in the things I want to be successful at — but that’s off topic) but I think I did pretty good this weekend. I got up, for the first time ever, and spoke at the open mike. This is just a little daunting, and in my past experience at these things, the mike is usually commandeered by a select few with a special agenda to sell. This time, however, that wasn’t flying. Made for a nice change. I also spoke up and out when I had the chance. So many of the people who attend these CUPE events are such radicals. They see things in only one colour — black or white — neither of which is a colour, but, there you go. I tend to see things in all shades and consider myself more of a conservative (not CONSERVATIVE) for those of you who will jump at the chance to flog me for that choice of word. I don’t take an extremist position or point of view, I try to see things in terms of what will work for the best for everyone. Apparently, this makes me a weak unionist. So be it. I’d rather be a weak unionist who manages to get what’s best for the membership I represent, than an extremist who constantly puts their jobs in jeopardy. Well! I got that off my chest. And all because I had the guts to say what I felt this weekend. And lets face it — the signs all over the walls said to listen, respect, and contribute. I was only doing what was expected. On another topic entirely: watched the movie The Help last night. It’s a wonderful film. If you get the chance you should see it. I wanted to read the book first, but just knew I wouldn’t have time before the Oscars at the end of the month and I do want to see all the contenders before the awards ceremony. It’s a wonderful story of women, both black and white, in the 50’s, and the racial and societal constraints each had to deal with. It’s not over-wrought, there’s (thankfully) not a lot of violence, though it is alluded to. It is a very intelligent movie with lots of humour and insight. I don’t think I’ll ever look at a chocolate pie in quite the same way again. Watching it I couldn’t help but admire the lovely dresses these women wore. I often wish I had lived during that time simply so I could wear such gorgeous dresses. Of course, I wouldn’t have wanted to live in such repressive conditions, but, oh, those dresses! In my job wearing a dress to work would be simply stupid. And because I’ve become so accustomed to wearing slacks, jeans and cords, when I do put a dress on I feel awkward. Isn’t that silly? I somehow feel like I’m “showing off” or not being my ‘real’ self. How is that we come to place such restrictions on ourselves? I’m thinking that maybe, just maybe, I’ll go shopping one of these days and pick myself up a couple of nice everyday dresses that I can wear around the house. Dresses suited for doing housework, but that look feminine and pretty. What do you think? Am I being unrealistic? Longing for something I never had? An experience that I don’t even understand? Or simply getting addled? Help me out here with your comments! Just some pics I downloaded from Google Images to illustrate the kind of dresses I’m talking about.